It’s an Anomalie for Liz. It’s an Anomalie for Markita. It’s an Anomalie for Kaycee. It’s an Anomalie for Maggie & Christine. It’s an Anomalie for Steph. It’s an Anomalie for Brittany. It’s an Anomalie for Hana. It’s an Anomalie for Madison. 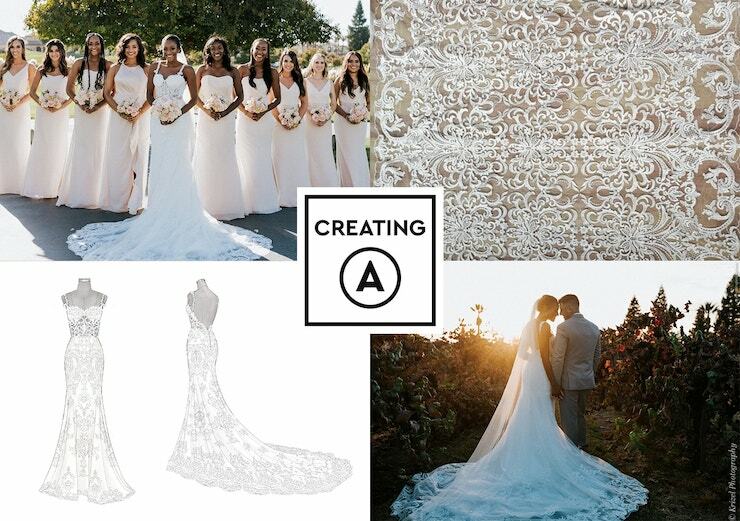 Anomalie brings more transparency, customization and value to wedding dress shopping by partnering with the world’s top dress designer workshops and selling direct to brides online. Silk materials, top quality craftsmanship, a revolutionary online interface and dedicated stylist who treat each dress as it was their own. Take our bridal style quiz and unlock inspiration for your perfect dress. Upload inspiration photos to your "lookbook," meet your stylist and discuss the details of your vision on your design consultation. We’ll provide expert consultation throughout the entire process. We’ll collaborate to bring your custom design to life. 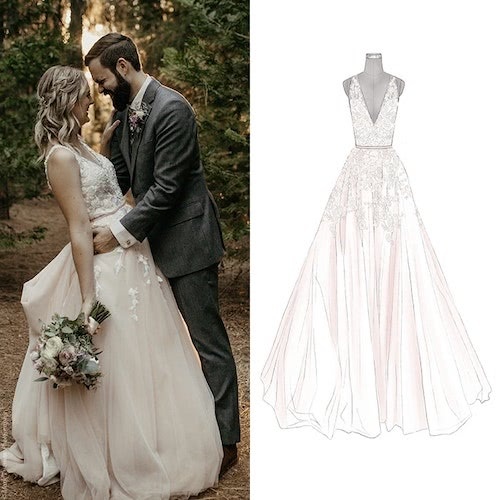 Receive a custom sketch of your dress, hand-select your fabric, lace and beading, confirm your measurements, sign off on the final design details. 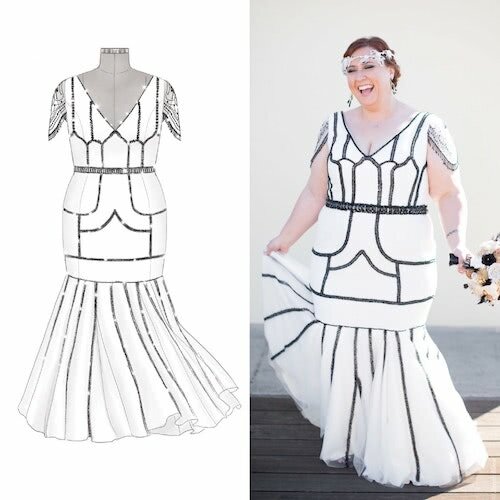 Unbox your custom Anomalie gown! Our talented team is here to consult on any questions and alterations as desired. We vow a 100% return policy if you don’t absolutely love your dress. Your vision brought to life, at a fraction of the boutique price. We offer a transparent process and straightforward pricing with dresses starting at $1,000. Everything about this experience felt like my ideas and interests were put first. And seriously, it was so much fun! See what our brides have to say about their Anomalie experience! We weren’t happy with the wedding dress industry, so we set out to change it. We work directly with suppliers to ensure the highest quality for the lowest price, and we are constantly innovating new technology to make your wedding dress experience outstanding. Anomalie offers and entire line of affordable online semi-custom veils. Pick you length, trim detail, and more without the insane boutique markup. We make the decision of going custom for your wedding dress easy. You’re dedicated squad, comprised of industry experts, will work with you personally to bring your wedding dress vision to life. 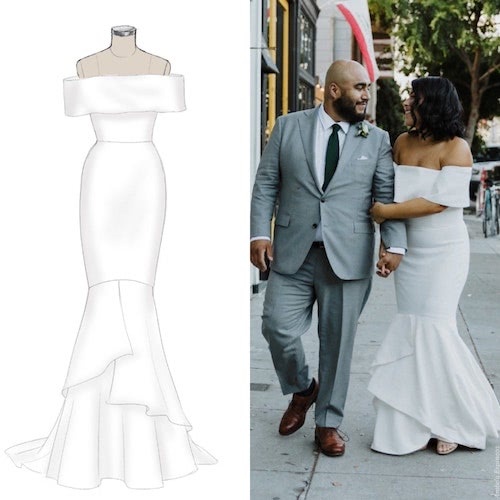 You’ll work with your Squad to finalize every detail of your custom dress before our production team goes to work bringing your vision to life. You pay for the price of your gown, we take care of getting it to you. We’re all about being #ProBride. This is our form of commitment on both sides. Sign up and talk to a stylist. Our team is ready to turn you dream dress into a reality. Sign up and schedule a call to speak with a stylist about your vision. We can’t wait to connect and learn more about your dream dress! Hello! Whose bridal style are we discovering?